ArcNews Fall 2003 Issue -- China, Greece, and Cambodia--Esri T-Shirts Go the Distance! 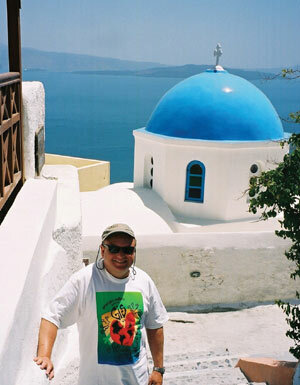 China, Greece, and CambodiaEsri T-Shirts Go the Distance! Tito Vandermeyden, GIS engineer, NextBus Information Systems, Inc., Emeryville, California, recently visited the Three Gorges Area in China. 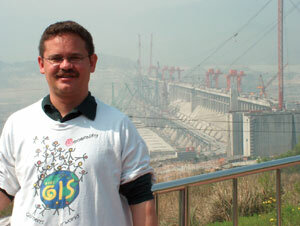 With the Three Gorges Dam in the background, he proudly showed off his Esri T-shirt. The dam is almost completed. Hundreds of thousands of people will need to be moved to higher ground as the whole area will soon be flooded. "Really impressive," he tells us, "but also controversial." Mark L. Hochstein, GIS specialist, city of Sugar Land, Texas, and his wife visited the island of Santorini, Greece, while on a two-week cruise through the Mediterranean Sea. He explains that Santorini is the proud home of hundreds of churches with blue domes. It was really nice of him to wear his Esri T-shirt during his sightseeing. Lisa A. Pierce, research associate, Water Resources Institute, California State University, San Bernardino, had her photo snapped at Angkor Wat in Cambodia. 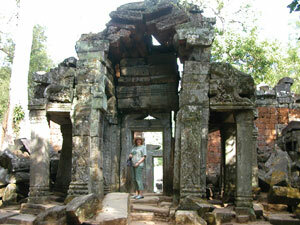 To get there she needed to travel for four hours along the border between Thailand and Siem Reap, Cambodia. One problem, she explains, was the "really bad road conditions." We are so glad she wore her Esri T-shirt on her travels. Check out more Esri T-Shirt pictures in the new expanded section below. Ashok Wadwani, president, Applied Field Data Systems, Inc., Houston, Texas, an Esri Business Partner, vacationed in Costa Rica, where he took in the sights, including the region's many volcanoes. 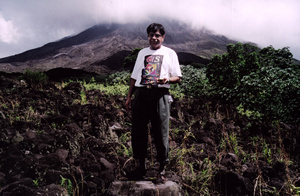 Here he proudly shows off his Esri T-shirt near the base of the spectacular Arenal Volcano. 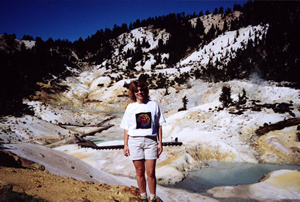 Speaking of volcanoes, Mel Howard, GIS analyst, Shasta County Public Health, is modeling her Esri T-shirt in front of the thermal pool called Bumpass Hell, which is part of northern California's Lassen Volcanic National Park. She tells us, "Active volcanism is evident in the boiling waters, bubbling mud pots, and hissing steam vents." Paul Lauder, GIS manager, Dallas Central Appraisal District, Dallas, Texas, tells us he is wearing "one of his finest Esri T-shirts" at a point that is exactly halfway between the equator and the north pole. He adds, "I am one-eighth of the way through my goal of circumnavigating the globe. 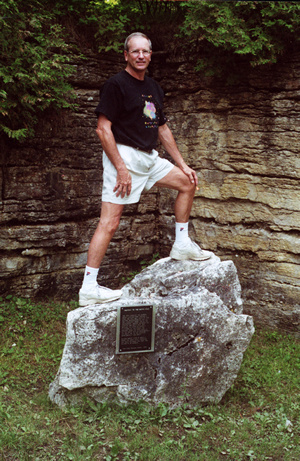 This picture was shot while I passed the 45th parallel in a small roadside park in Door County, Wisconsin." Wear an Esri T-shirt in a unique location. Send a photograph to Thomas K. Miller, ArcNews editor, ArcNews T-Shirt Feature, Esri, 380 New York Street, Redlands, California 92373-8100, USA. Digital photos sent via e-mail are preferred. For additional information on this feature, contact Thomas K. Miller (tel. : 909-793-2853; e-mail: tmiller@esri.com).